Virtualization is in a transition phase from Virtualization 1.0 to Virtualization 2.0. The next wave of virtualization is all about cloud computing. But what makes up cloud and how do I get started? This presentation will walk through the building block pieces required to build an internal cloud and the steps necessary to get started. If you have more than 4 servers in your environment then you'll want to make sure to listen to this talk to find out how you can run your datacenter more efficiently. 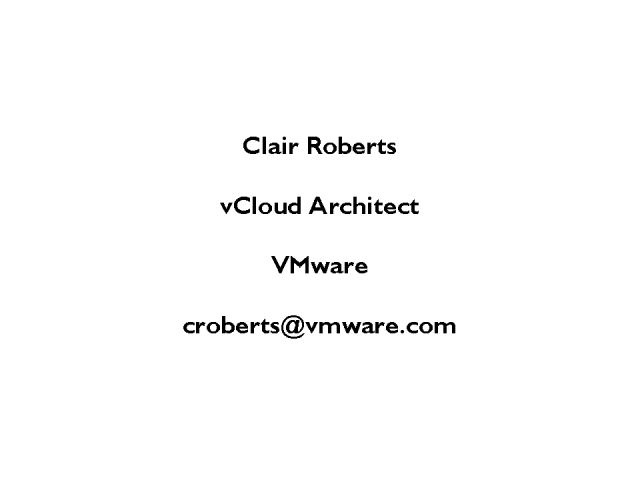 Clair Roberts; vCloud Architect in Technical Services, VMware Inc. Presented by: Clair Roberts; vCloud Architect in Technical Services, VMware Inc.